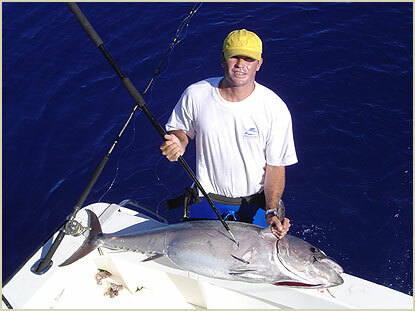 JIGGING is a new type of Fishing which is really effective in Tropical waters. It has been introduced in the Island in early 2005 by a group of Japanese anglers. It is now becoming one of the most popular types of fishing on the Island as the locals also got hooked by this type of fishing. Since then our fishing boats are now equipped with high precision fish finders to help us find that fish you’re after. Vertical jigging is an intensive sport that consists of dropping a 200 to 300 grams spoon down to a certain depth, near a wreck, drop off or peak. You then reel the spoon up with a jerking motion on the rod that produces a rise in the lure followed by a slow flutter. - Jigging For Bottom Fish in about 150 feet to 600 feet water and target fish like dog tooth tuna, sacre chien blanc, sacre chien rouge, flounder, snapper and grouper. - Offshore Jigging is best suited for yellow fin tuna, big eye tuna, skipjack tuna, amberjack, mackerel, wahoo and many others.